Brain training: The future of psychiatric treatment? What if, instead of taking a pill or talking with your therapist, you could train your brain to be healthier through a video game? Brain training is becoming increasingly feasible using a technique called neurofeedback, which allows individuals to change the way their brains function by responding to personalized feedback about how their own brains work naturally. This is one approach being used to treat those struggling with neurological or psychiatric disorders, such as children diagnosed with attention deficit hyperactivity disorder (ADHD), who have difficulty focusing their attention. We now know that a focused brain acts differently than an unfocused brain. Researchers and clinicians are currently investigating whether we can use neurofeedback training to help children induce a “focused” brain state. An important premise of neurofeedback training is that our brains have the ability to change the way they function. Research over the last several decades indicates that our brains are, in fact, malleable. The question, then, is how to influence brain function to stimulate this change. The trick to getting our brains to act in desirable ways is to leverage the behavior-changing power of operant conditioning. During an operant conditioning procedure, an individual modifies its behavior based on learned consequences. For example, if a dog receives a treat each time he sits on command, then he will eventually learn that sitting leads to treats (which he wants very much), and the likelihood increases that he will sit on command in the future. Humans learn in very similar ways. And, as it turns out, we can use operant conditioning to teach ourselves to promote healthier brain functioning. In neurofeedback training, this is accomplished by pairing information about one’s brain activity with desirable or undesirable outcomes, often in a virtual context, such as a video game. When we generate desirable brain activity, we are rewarded, say by gaining points in the brain-training game; when we generate unwanted activity, we may lose points. Repeated exposure to such gains and losses can bring about long-lasting changes in brain activity. How can we detect brain activity? 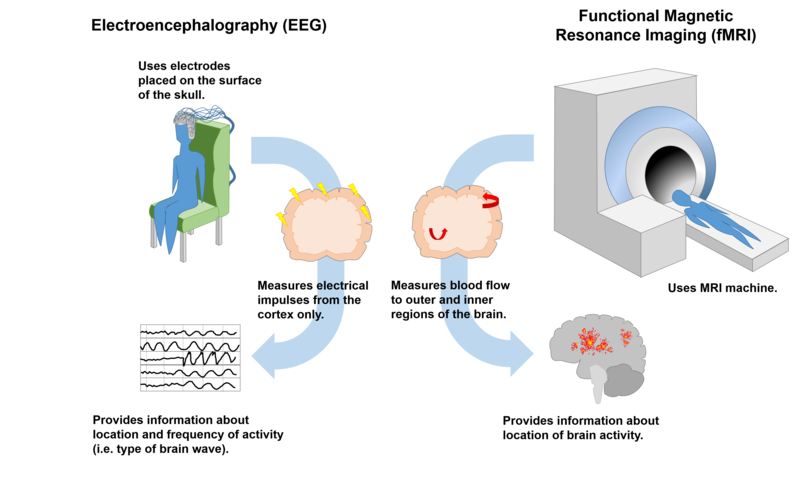 There are two widely used, non-invasive techniques that detect different aspects of brain functioning: electroencephalography (EEG) and functional magnetic resonance imaging (fMRI) (Figure 1). Figure 1. Neurofeedback commonly makes use of two technologies to obtain information about brain function. Electroencephalography (EEG, left) uses electrodes placed on the scalp to detect electrical impulses produced by neurons residing in the outermost layer of the brain, the cortex. Functional Magnetic Resonance Imaging (fMRI, right) measures how much blood flow each region of the brain receives; here, blood flow indicates which regions of the brain are most active. EEG is a common method by which we can detect brain activity in the cortex, which is the outermost layer of the brain. Activated neurons possess an electrical charge. When groups of neurons are activated at the same time in the same place in the cortex, as occurs during various behavioral or cognitive tasks, the cumulative electrical energy can be detected by electrodes placed on the scalp during an EEG test. These electrical signals are referred to as brain oscillations, or waves. The multiple different kinds of brain waves each represent a different aspect of brain function. By contrast, fMRI detects patterns in blood flow to cortical areas as well as those lying beneath the cortex. Areas that receive more blood flow are considered to be more active. Because different brain regions have different functions, we can make inferences about how the brain works by observing which areas receive blood flow during various tasks. Either of these approaches can be used to deliver information about brain function to an individual undergoing neurofeedback training. fMRI relates which parts of our brains are active, while EEG reveals the nature of the observed activity. How can neurofeedback be used to treat disease? Many different psychiatric disorders are characterized by specific patterns of brain activity, leading researchers and clinicians to investigate whether EEG and fMRI-based neurofeedback training can be used to treat such disorders by altering pathological aspects of brain function. To examine how this might work, let’s return to how neurofeedback training might be used to help children with ADHD increase their focus. Children diagnosed with ADHD tend to have an excess of low frequency (theta) brain waves and fewer high frequency (beta) waves in certain regions of the cortex, as detected by EEG (Figure 2). Therefore, neurofeedback training for children with ADHD attempts to minimize the occurrence of lower frequency theta waves and enhance the occurrence of higher frequency beta waves. This is done by rewarding the children each time they demonstrate beta waves during neurofeedback training. Through the process of operant conditioning, the children intuitively learn to promote beta waves and suppress theta waves (Figure 2). Figure 2. Neurofeedback as a treatment for attention-deficit hyperactivity disorder (ADHD). Children diagnosed with ADHD, who struggle to focus their attention, tend to display lower levels of high frequency beta waves and higher levels of low frequency theta waves, while children without this diagnosis show the opposite pattern (left). This observation suggests that beta waves are associated with an enhanced ability to focus. Neurofeedback training therefore seeks to elevate the magnitude of beta waves and suppress the magnitude of theta waves using operant conditioning paradigms (right). During training, the patient receives feedback about their own brain activity, sometimes in the form of a videogame. Interestingly, studies have shown that neurofeedback training as a therapy for ADHD may be even more effective than the standard medication (Methylphenidate/Ritalin) used to treat this disorder. This was shown in 2002 by Vincent Monastra and colleagues at the FPI Attention Disorders Clinic in New York, who studied 100 children diagnosed with ADHD (Figure 3). All of the kids were prescribed Ritalin, while approximately half of them also participated in neurofeedback training. The children who participated in neurofeedback training in addition to taking Ritalin showed greater improvements in focus and a significant decrease in hyperactive/impulsive behavior. Furthermore, only those children who underwent neurofeedback training showed promising changes in patterns of brain activity associated with increased focus. Even more striking was that these behavioral and neurological improvements persisted even after medication was stopped. This was not true of those children who took Ritalin but did not participate in the neurofeedback treatment, suggesting that brain training has the potential to induce long-term changes in how one’s brain works. Figure 3. Clinical trial reveals that neurofeedback training outperforms medication in treatment of ADHD. This figure schematizes the experimental setup and outcome of the study conducted Monastra and colleagues in 2002. One hundred children diagnosed with ADHD were enrolled in the study. For one year, all of them were treated with medication (Ritalin), while half had their treatments supplemented by neurofeedback training. 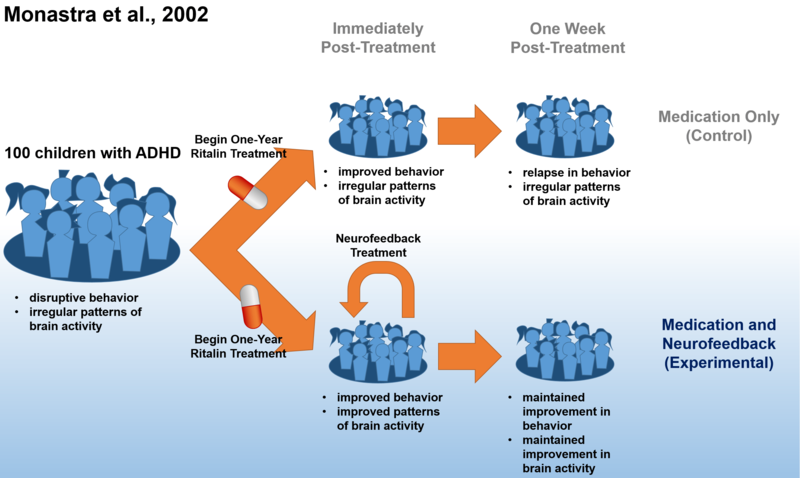 Immediately after the 1-year treatment period, the Ritalin-only group showed moderate improvement in the behavioral symptoms of ADHD while showing no improvement in patterns of brain activity associated with the ability to focus attention. By contrast, children treated with medication and neurofeedback training showed significant improvements in both behavior and brain activity patterns. Interestingly, one-week post-treatment, the beneficial effects of the neurofeedback-supplemented regimen persisted, while that of medication alone did not. Why aren’t neurofeedback treatments more mainstream? As promising as many of the studies pertaining to the neurofeedback therapy are, they bear some considerable caveats. One example is the fact that many clinical trials testing the efficacy of neurofeedback training do not randomize the subjects into treatment groups, since it is considered more ethical to let patients choose which treatment group they prefer. As a result, it is possible that the treatment groups may not be composed of comparable subject populations at the outset of the experiment, which in turn may skew the results of the study. In truth, there is much that is yet to be learned about the potential of neurofeedback to be used for therapeutic purposes. In addition to increasing the number of truly randomized controlled clinical trials, it seems that the trickiest part of establishing neurofeedback as an effective therapeutic approach to treating psychiatric disorders is to know exactly what our biological measurements are telling us. What exactly do patterns in EEG and fMRI readouts mean about how our brains work? More basic research into the meaning of neurofeedback signals is needed to fully answer this question. For now, the gold standard for treating psychiatric conditions remains medication and various forms of therapy. Nevertheless, studies such as that performed by Monastra and colleagues suggest that there may be a bright future for neurofeedback training in the treatment of certain psychiatric disorders. Such studies have inspired commercial efforts to develop portable and affordable neurofeedback devices that can be used in the comfort of one’s own home. Chances are good that very soon you will be able to ask your doctor about this alternative treatment! Tedi Asher received her PhD from the Biological and Biomedical Sciences Program at Harvard Medical School in 2016 where she studied neurobiology. Mostly people think that playing video games is perhaps the best brain training, but such games are mostly paid. You cannot increase the efficiency in your brain training by meditating. However I think brain training could be totally free because substitution in your diet and a way to reduce your stress, some physical exercise and simple brain exercise that could be reading or brain teasers can be found profoundly helpful for mental health. Taking care of these routines could prevent you from later psychiatric treatments. According to a survey there are roundabout 450 million people from are all over the world that are having mental disorders. And sadly it is predicted to be more in 2020. That’s why the future of psychiatric treatments seems very bright, fortunately and unfortunately. Our group has shown that surface neurofeedback training combined with brief, daily LED-based, near infrared light stimulation of the cortex can significantly alter memory and motor performance. Adding this to regular exercise and diet change offers a low cost and actionable way to impedenandbreverse age related cognitive and physical decline. Clinical trials are being conducted now involving home based use of neurotraining and Photobiomodulation technology. The article said:” Interestingly, studies have shown that neurofeedback training as a therapy for ADHD may be even more effective than the standard medication (Methylphenidate/Ritalin) used to treat this disorder. This was shown in 2002 by Vincent Monastra & colleagues. lovely post. Interesting to read. Its good that we have non-invasive techniques that detect different aspects of brain activity and functioning: electroencephalography (EEG) and functional magnetic resonance imaging (fMRI) . The science is an area, that there are so many people in-working,testing,researching,trying, summarizing etc. Still a big amount of people with mental health problems. I do hope and wish every year i better in terms of studies and researches carried out with the medication to treat different problems that people suffer in today’s world. I want to thank every single who are involved and helping out! Your work is much appreciated ! We badly need you. Better knowledge of brain functioning, the pathologies that affect it, and the development of more precise new technologies can shorten the gap between cutting-edge scientific knowledge and day-to-day clinical practice. Congratulations! I hope one day children will be tested for ‘at risk’ psyche features at a young age so that help for them will be routinely available. Not just for the advantaged, but for all children in our nation. Maybe this will be an answer to much of the suicide/ violence/ underachievement we see. We tend instead to wait so long until real problems arise. This should be part of everybody’s routine work up. Does neurofeedback works for Autism? Anyway, in short. Before NFB I was about as close to non-functional as you could get living on my own and losing weight because I couldn’t be bothered to go to the store sometimes. Last June I graduated from Eastern Washington University with a 3.7 B.S. in psychology. I would love to go on and get a PhD in clinical psych, with a focus on NFB (QEEG) related tools to assist in treatments. The trouble is, such programs are very hard to find, and those that I have found are simply terminal master’s programs. I wish I could find a school (and the funding) to go to a school that is open minded enough to let me pursue a clinical psych program that was more interdisciplinary. I hate having to decide between spending 5+ years studying things I don’t agree with to qualify professionally to help people vs studying things I am really interested in only to be stuck doing teaching and research. I would love to hear some feedback about the skeptical article in Psychology Today referenced above. Scam, placebo or do it help? I have tried neurofeedback training 2years ago for 12 sessions. They told me I have high wave of beta up to around 30 meaning that I had quite an fast moving active wave to prevents information coming through. That meant it was also hard to keep information. At the end of the training, I felt my memory had improved but not for long and not much else improved either. So I would say for me it didn’t work and I wasted a lot of money. I have been advised to go on a ten day meditation course instead. Does Neurofeedback help those who are special needs, or low IQ to increase their IQs?